Main waste rock dump at the Tintic Standard Mine. In this post, we will report results and draw conclusions for our study of soil contamination in the Tintic Mining District. This study was supported by a grant from the American Chemical Society. 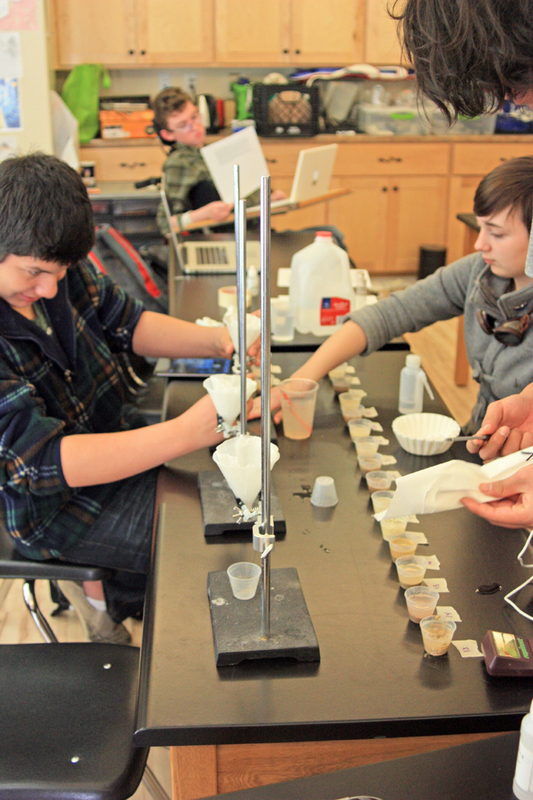 Students from Walden School of Liberal Arts brought back 42 samples of soils from the area in and around Eureka, Utah. Our purpose was to test for heavy metal contamination, especially lead. 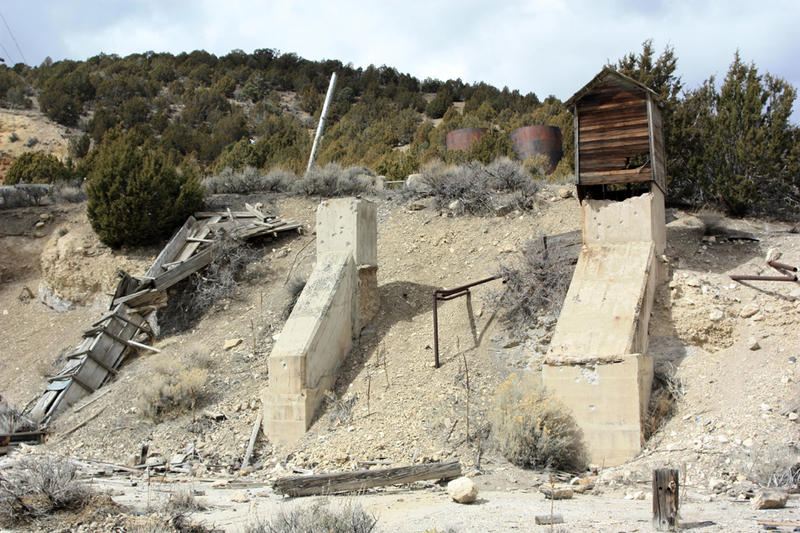 Previous tests done by the Utah Department of Health and the EPA showed lead contamination to be widespread throughout the town, due to the presence of historic concentration plants in the town and the use of mine waste rock as fill in many lots. 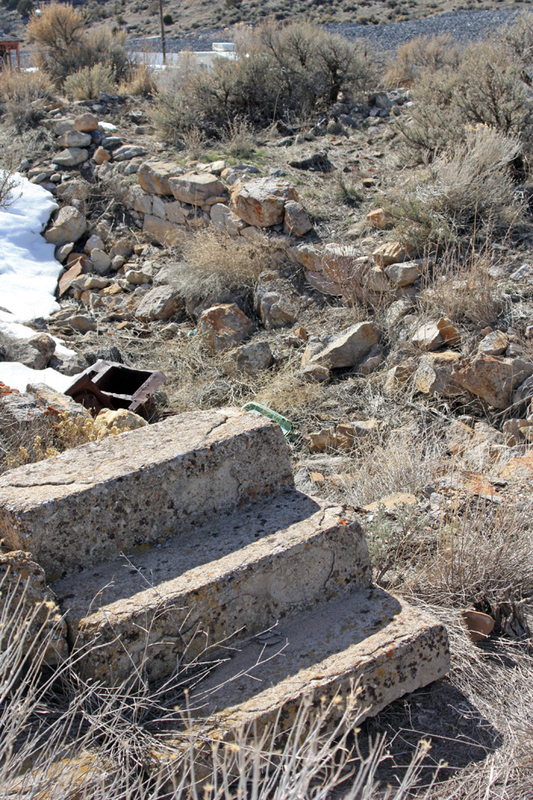 Since there are mine dumps on the hillsides south of town, rain runoff also brought lead contamination into the residential areas. 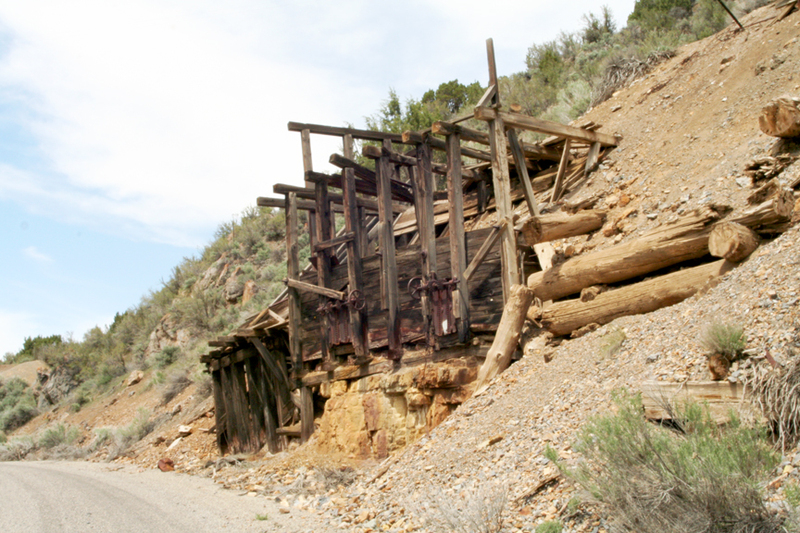 Western side of the Swansea Consolidated mine dump near SIlver City. These tests led the EPA to declare the town a Superfund project and spend $26 million to replace soils in some areas of town (but not all). They also placed limestone riprap over the mine dumps to prevent further runoff. 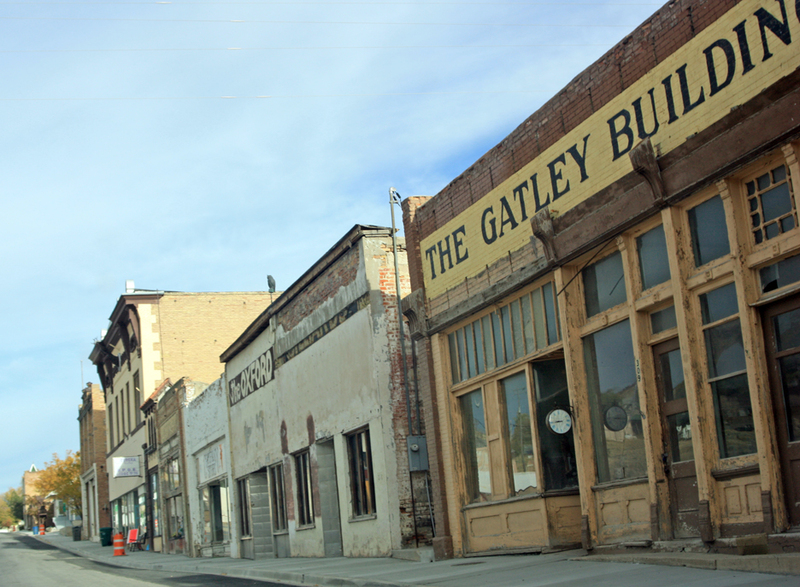 The process took ten years and completely changed the look of the town, damaging or destroying several historic landmarks along the way, such as the headframes for the Eureka Hill and Gemini mines. 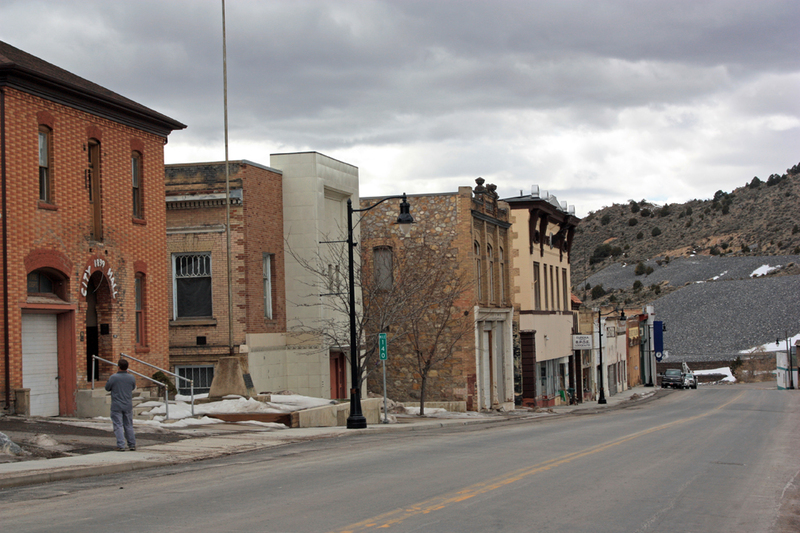 Two landmarks, the Bullion Beck headframe and the Shea building, were restored. The rest have been left in ruins. Middle section of the Swansea Consolidated mine dump near Silver City. All of the tests we conducted were put into numerical form and entered into a spreadsheet so that we could compare the results. We used an ALTA II reflectance spectrometer to measure reflected light at eleven wavelengths, including four infrared wavelengths. We also tested the pH of the samples using several methods, including universal test strips, a garden soil test kit, and a pH meter. We tested for lead using a sodium rhodizonate solution, which changes from orange-red to pink in the presence of lead in neutral soils and to green or blue in the presence of lead in acidic soils. Please see our previous post for details on these tests. Since the rhodizonate test was qualitative, we assigned numbers depending on the color of the final solution so that some comparison could be made. For the samples, we selected ten areas inside the town of Eureka, including some where the soil has been replaced and others where the soil is original. We tried to pick areas that were representative of the town as a whole. 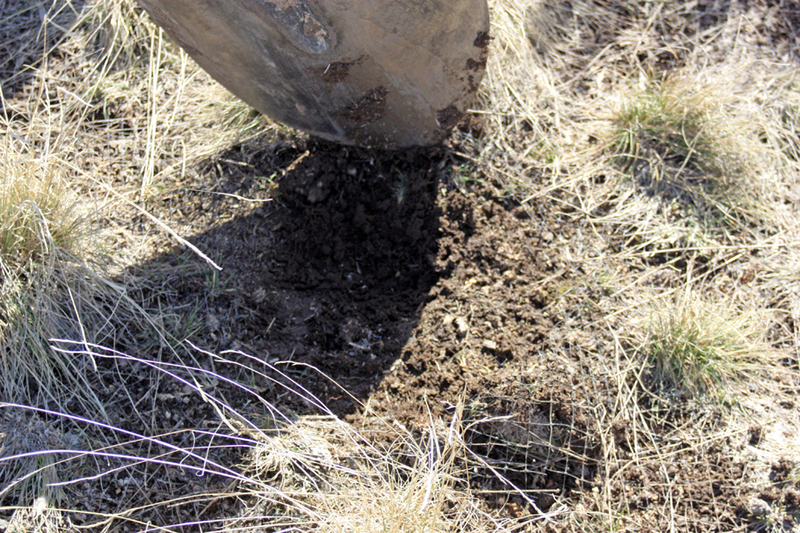 At each site, we sampled the surface soil and soil about six inches below the surface. We also sampled 12 sites outside of town, including areas away from town as controls and areas on or near exposed mine dumps, such as those from the Tintic Standard, Swansea Consolidated, and Tesora mines. We also took samples from gullies or washes downstream from mining areas and dumps, and from an exposed ore body (which has not been mined or processed) at a road cut along U.S. Highway 6. 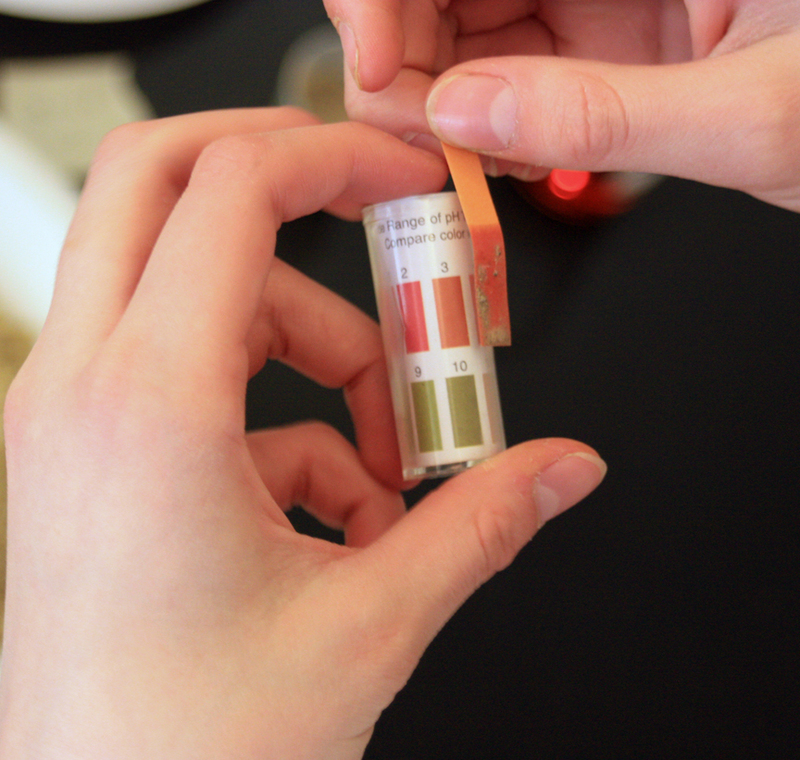 Chart 1: Comparing Different pH Tests of Soil Samples. The readings taken with our portable pH meter provide the most consistent results (and can be done easiest in the field). As you can see from Chart 1 shown here, of the different methods we used to determine the soil pH, the pH meter was the most sensitive and consistently accurate. It was also easiest to use. It showed that most of the samples, were slightly acidic (between 6 and 7), but the samples taken from mine dumps and the areas immediately downstream were extremely acidic; in fact, some samples had a pH too low for our meter to read, which had a low limit of 2.5. Although not shown on this chart, the samples taken inside Eureka on our fourth collection trip all showed pHs near neutral (6 – 7). Our lead test showed no discernable lead inside Eureka, even in soils that had not been replaced by the EPA. This is probably because our test is not sensitive enough for low lead levels. It becomes hard to distinguish the original color of the rhodizonate from the natural color of the soil unless there is enough lead present to create an obvious color change. In Chart 2, low levels of lead correspond very well with neutral pH soils. Chart 2: Comparing Soil pH with Lead Levels. The lower the pH (more acidic) the soil samples were, the more lead was present with a correlation coefficient of rho = -0.876. The most interesting result of our study was to compare pH with lead levels. Chart 2 shows that the highest lead levels were found on or immediately downstream from mine dumps, which correlated very well with low pH levels with a correlation coefficient of rho = -0.876. Mine dump soils had high lead content and were highly acidic. Of course, this doesn’t imply causality: the high acid doesn’t cause lead, and the high lead probably doesn’t cause the acidity, but if one is present, so is the other. soils were darker and richer in humus, whereas mine dump soils were pale and yellowish. In Chart 3, the reflectance spectrometer tests were inconclusive as far as detecting a signature for lead. 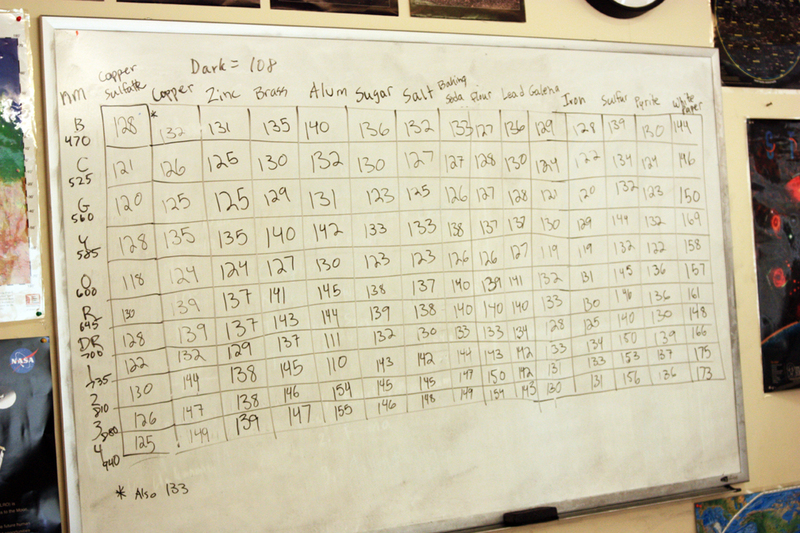 We compared the results shown with samples of pure lead, pure galena (lead sulfide), and silver-lead ore. There were no obvious wavelengths that gave a definitive fingerprint for only lead. The one useful result of the spectrometer tests was to confirm the overall health of the soil samples; those with lower percent reflectance overall were darker, richer, more healthy soils with more plant life growing. The lighter soils had less plant life and higher overall reflectances. 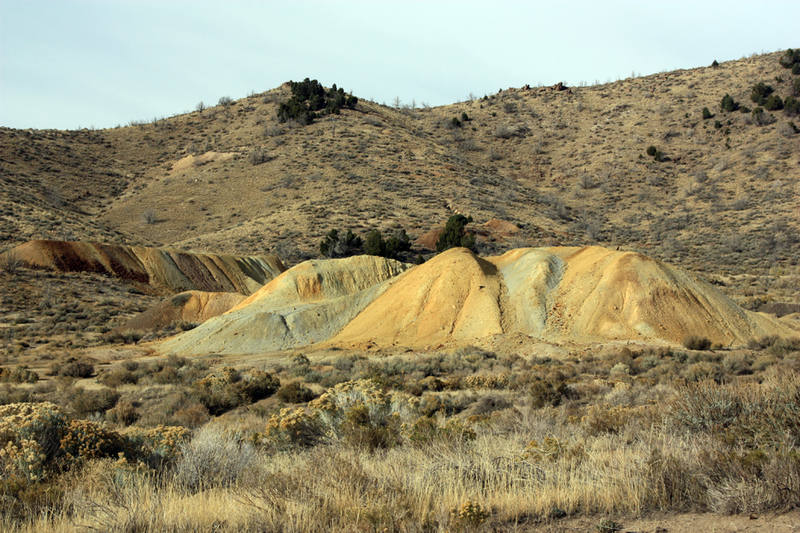 The soils at mine dumps were yellowish to light purplish due to the presence of sulfur compounds, and these also had no plant life, lower pH, and higher lead. Chart 4: Comparing the Levels of Nitrogen, Phosphorus, and Potassium in Soil Samples. The nitrogen and phosphorus tests gave no predictable results, whereas the potassium test showed higher levels of potassium in mine dump soils with high lead content (rho = .687). 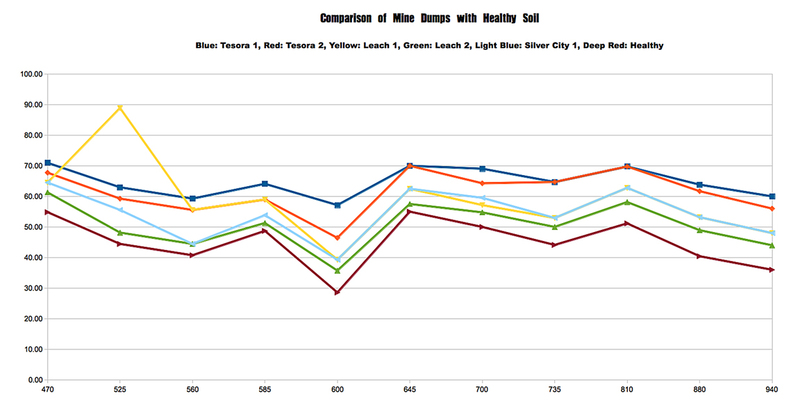 Chart 4 shows the tests we conducted on soil nutrients. The nitrogen and phosphorus tests were inconclusive, and are probably due to the poor quality of the garden test kit we used. The potash (potassium) test did show higher potassium in the mine dump soils where lead levels were also highest, although the correlation was only moderate (rho = 0.687). 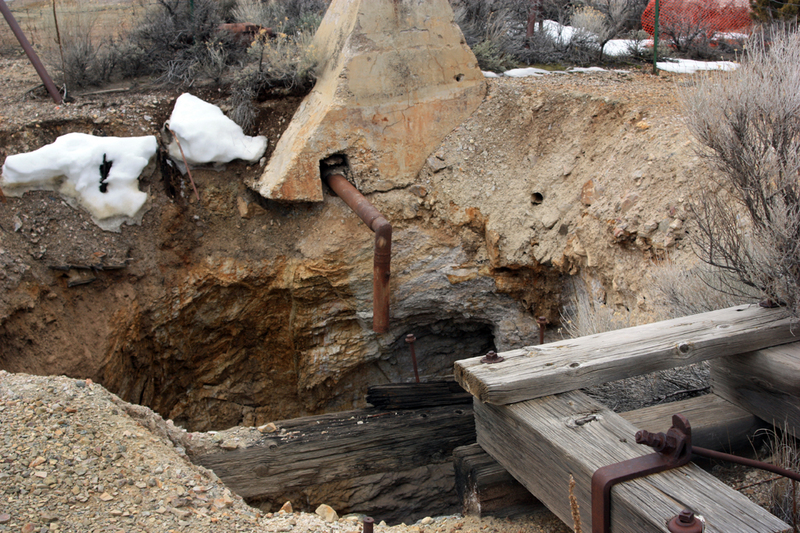 A visual inspection of the mine dumps outside of Eureka, Utah in the Tintic Mining District shows that the waste rock and soils are highly contaminated. No plants grow on the dumps or in the gullies immediately below them. They are stained a bright yellowish-orange, and soils in the nearby gullies have layers of red, yellow, and even green. Overall, they are lighter and less rich than nearby soils with plant life. Our tests show that these mine dump soils are acidic and have high levels of lead contamination. Similar mine dumps were located at the west end of town (around the Gemini and Bullion Beck headframes) and south of town (Chief Consolidated and Eagle and Bluebell mines). If the same pattern of contamination occurred there as what we found in the Swansea, Tesora, and Tintic Standard dumps, then it is likely that the soils downstream in the residential areas of town were also contaminated by lead and sulfur compounds. We did not find evidence of this in our tests of original soils inside town, but our test was not sensitive enough to find the lowest levels of lead. Soil pH throughout the town was slightly acidic, which may indicate sulfur or even lead content. We were not able to get the data from the original EPA tests. 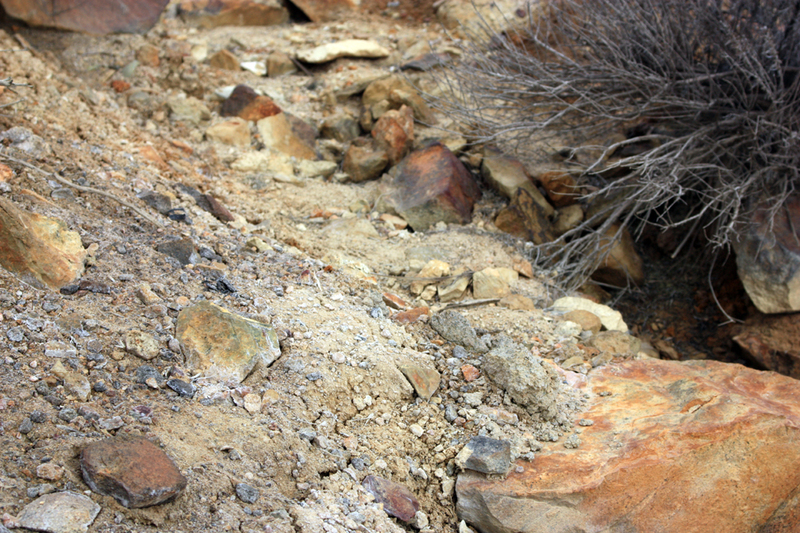 Soil discoloration in the wash west of the main Swansea mine dump at Silver City. Both pH and potassium content appear to be well correlated with lead content, with pH having a particularly high negative correlation (-0.876). Perhaps pH can be used as a marker, since it is easily measured. Where lead is suspected, a pH reading showing high acidity would indicate a strong possibility of lead. It would be interesting to see if the two measurements decouple as one travels further downstream from the mine dumps along washes and gullies. Do the lead and the acid travel the same distances? 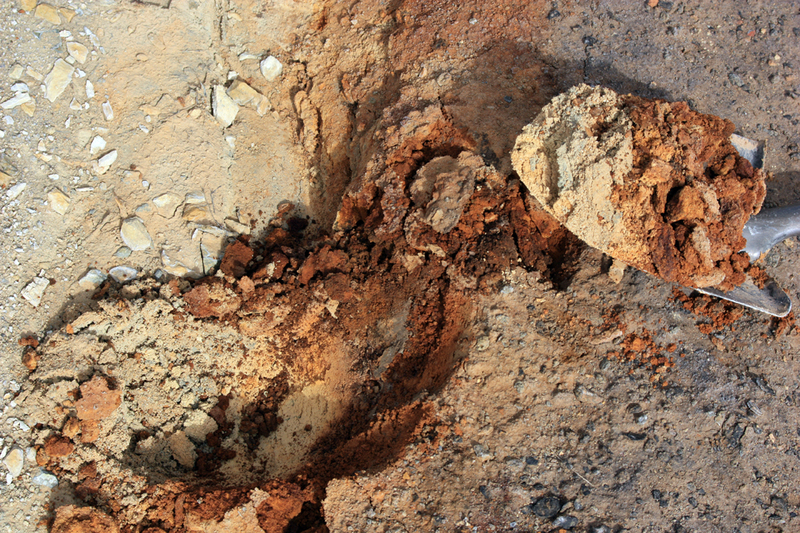 Soil layers showing different types of contamination, in the middle wash downstream from the Swansea mine dump. Much remains to be tested. We have some additional grant funds that we will use to send four samples to an outside lab for detailed element analysis. I also hope to take all our samples to a local university and use an X-ray Fluorescence Spectrometer or Raman Spectrometer to get an accurate and precise readout of the lead levels and other heavy metal content. We need to determine the amount of sulfur compounds in the soils, and how that correlates with pH. We also need to pass our samples through a soil sieve and measure the relative sizes of particles and the amount of humus in each. 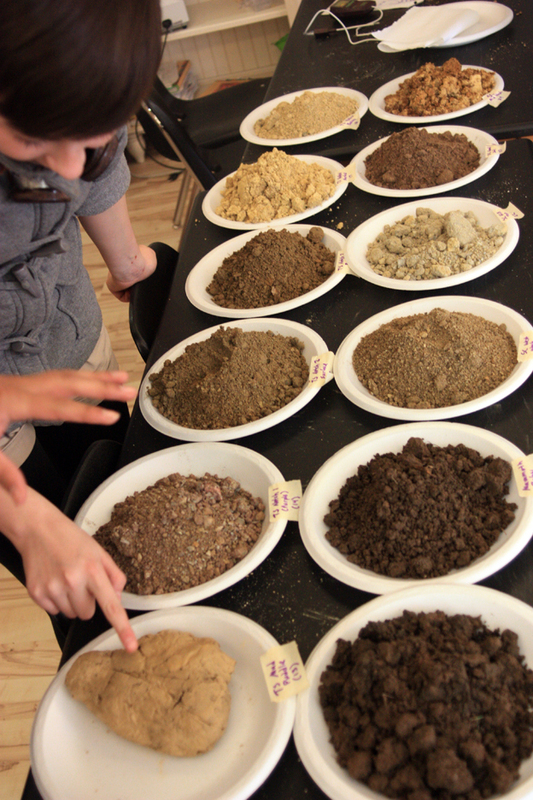 We should test the mine dump soils to see if plants will grow in them compared to the other samples. Finally, we need to return to the site and collect more samples of other mine dumps, as well as the soils around and downstream from the dumps we’ve already tested. We need to determine how far the lead contamination and acidity travel down the washes and gullies and the extent to which the slope of the land affects this. As with any field research study, it’s hard to keep all the variables constant. We’ve been careful and consistent with our tests, recording each location and using controlled testing conditions in the lab. But there are factors we can’t control. It could be that the low plant life on the dumps is simply because this is a desert, and plant life takes time to get established after soils are disturbed. The dumps were all dug up and the best materials were transferred to a leaching pile nearby in the 1980s. 30 years is not enough time for climax vegetation of sagebrush and juniper trees, but is enough time for grasses and low brush to grow. In general, soils in the area are poor in nutrients except where higher levels of water (such as in washes or gullies) allow more plants to grow and decay into better humus. Staining on the asphalt where water draining off of the Swansea mine dump runs over the road near Silver City. Although it’s been over six months since we conducted these experiments, I want to report on what we did before moving on to other topics so that these blog posts will be in the right order. So much has happened doing chemistry that I’ve fallen behind on reporting and writing about chemistry and the elements. During our Intersession class in March, we visited the Tintic Mining District three times in addition to our visit the previous fall. This made four collection trips altogether, and we got 42 samples from over 20 locations. Some of these were from areas inside the town of Eureka, some were outside in areas with heavy mining, such as on or around mine dumps, and some were control samples where no mining has occurred. Our goal was to test these samples for lead and other metal contaminants as well as pH. We did this in several ways. 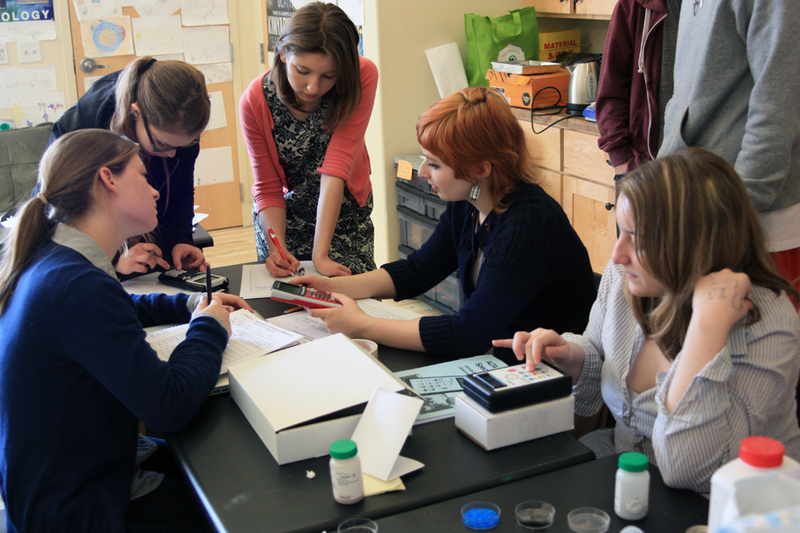 First, we took a field pH meter with us to test the soils as we collected the samples. Since most were gathered in March, the ground was damp and the pH meter worked well. The areas around mine dumps showed extremely low pHs (the meter pegged at about 2.5, so the samples were lower still). They also showed the most discoloration, ranging from yellow to purplish colors. These sites also had little or no vegetation. Even though the field pH meter worked well, we weren’t sure if it was consistent or reliable given that the soil samples had different amounts of moisture. When we took the samples back to our chemistry lab, we took them out of the Ziploc bags they were in and placed them onto paper plates to dry for several days. Students measured 10.0 g of each and added 25 mL of distilled water, stirring the samples to mix the soil with the water as much as possible. 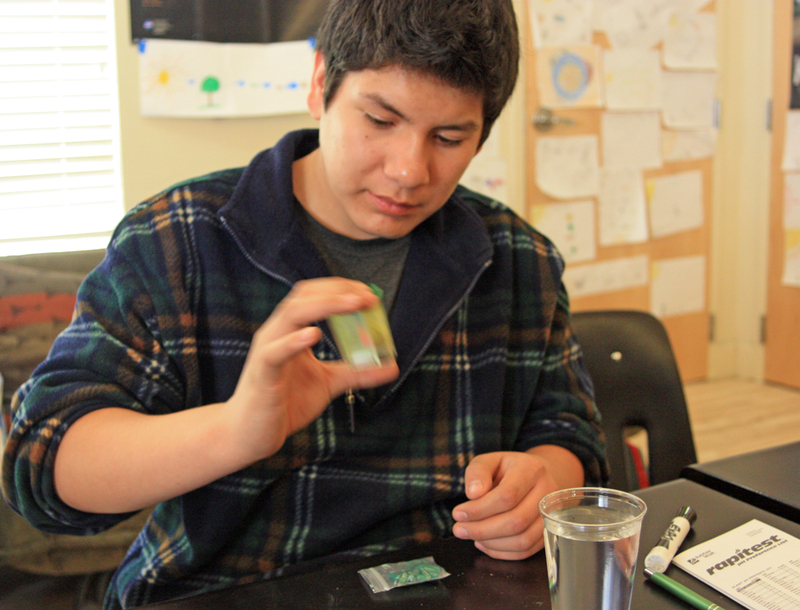 Then we tested each with the pH meter, universal pH test strips, and more specific test strips. We also used a garden soil nutrient test kit that included a pH test where a pill was emptied into the wet sample and color read off of a chart. The various results were set up on the whiteboard as a table, then my student Jem set up a spreadsheet to record and chart all the samples to compare which pH test method was most sensitive and accurate. Testing for lead with sodium rhodinzonate. The blue color of the second to last sample indicates both lead and acid. Another test was to see how much lead was in the samples. Our technique was to use a kit for testing lead in soils using a solution of sodium rhodizonate, which turns from reddish orange to pink in a control solution of lead nitrate. Our samples brought back from our first and second collect trips were tested by filtering out the sediment from the soil mixed with water, then taking the filtrate and adding the rhodizonate solution. Most of the solutions stayed orange, but one turned purplish blue, not pink. 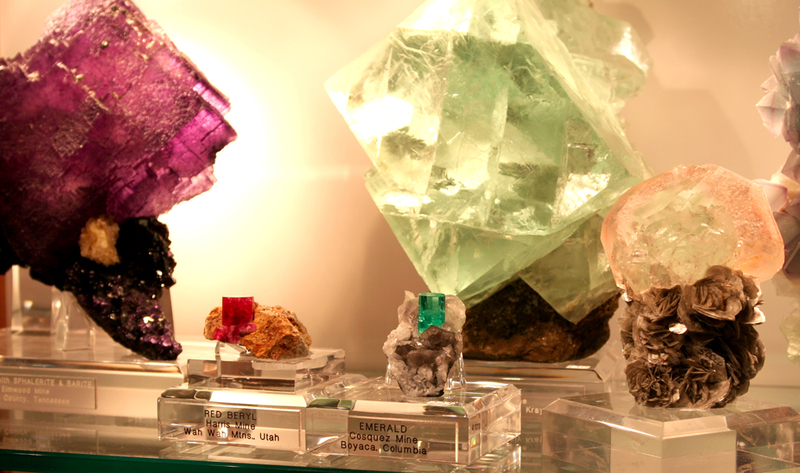 It was the sample taken from the Tesora mine dump. This was puzzling until one of my students, Sean, looked up the rhodizonate test and found that it does turn purple-blue if the sample is acidic. When testing its pH, we found it was highly acidic with a pH of 3.0. 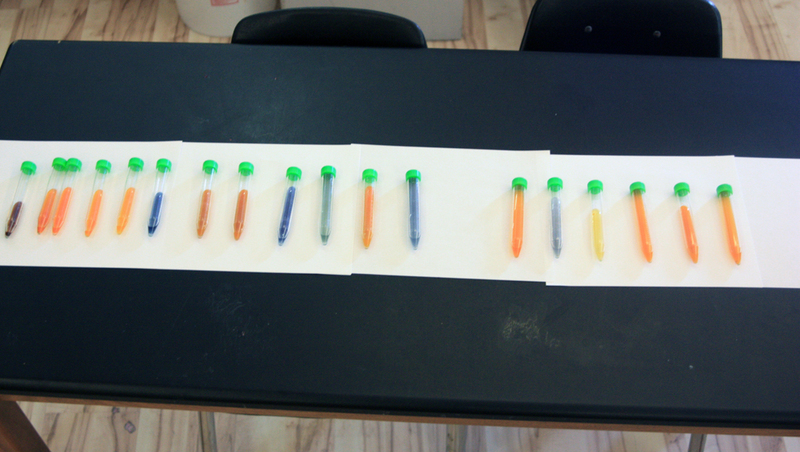 Results of rhodizonate test, with colors ranging from orange (no lead) through yellow (moderate lead) to green and blue (high lead). The test was qualitative, not quantitative. We began to see there was a correlation between low pH and lead content. As we repeated the test with other samples, we refined our techniques and came up with a color gauge that provided a rough quantitative scale for the amount of lead present. 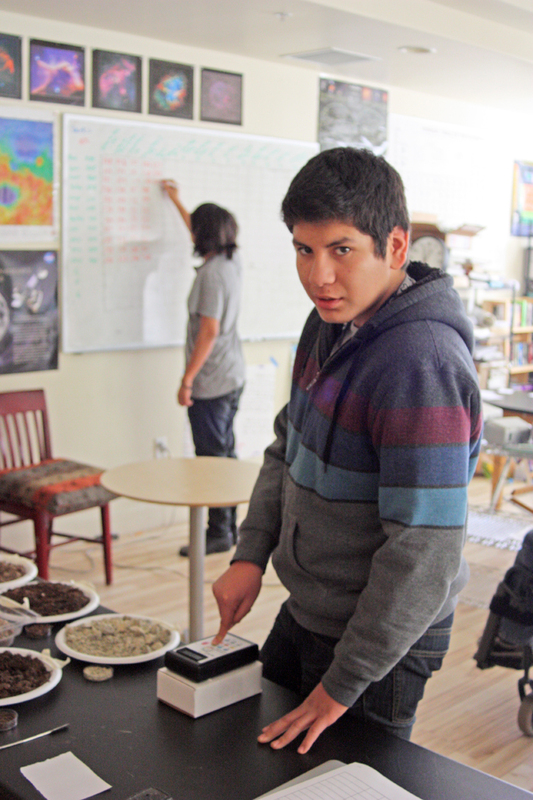 Most samples, including all from inside town, had a pH of 6.5-7.0 and the rhodizonate stayed orange. Where the pH was a little lower (6.0-6.5 and 5.0-6.0), such as in areas downstream for mine dumps, the rhodizonate turned orange-yellow or yellow. A pH of 4.0 – 5.0 showed a rhodizonate test of light green. A pH lower than 4 showed a test of blue. 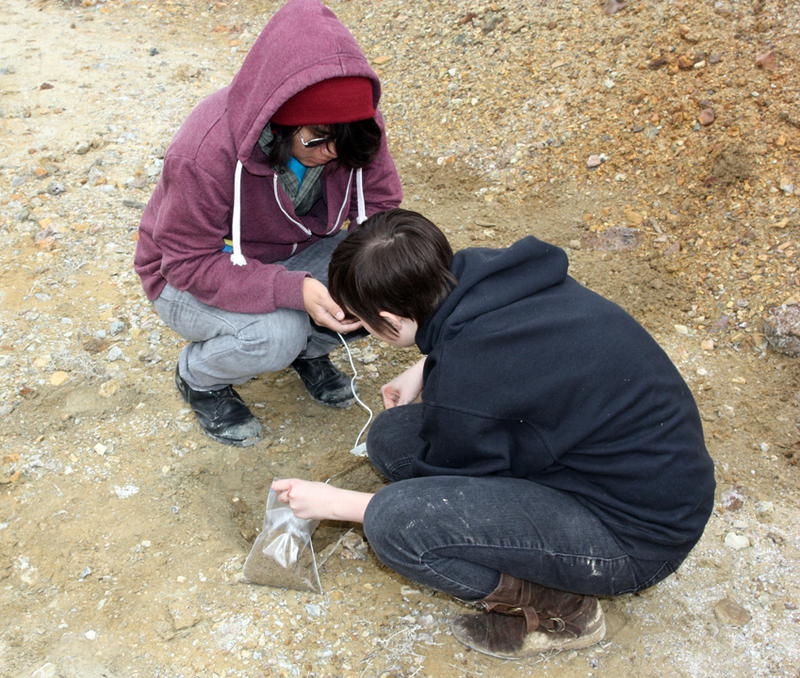 The correlations between the amount of lead and the acidity of the soil were very strong. We set up a scale of orange equals no to very little lead, yellow a small amount of lead, green a larger amount, and blue the largest amount with numbers 0 to 4. Unfortunately, the rhodizonate test is not specific enough to show actual quantities of lead, and we have no way of knowing if a number 4 (blue) test has twice as much lead as a number 2 (yellow) test. That will have to wait for x-ray fluorescence spectroscopy or some other technique. Control tests for lead using the sodium rhodizonate solution (on the right). 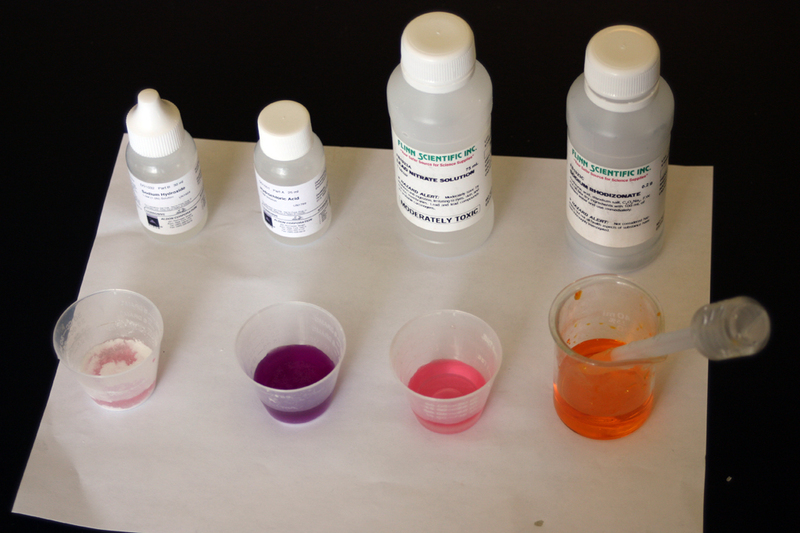 The second to the right shows pink color when the test solution is added to a neutral solution of lead nitrate. It turns purple (second from left) in an acidic solution that contains lead. It produces a white precipitate in a basic solution of lead. In the soil samples, lead in acidic soil produced a blue color. When a base was added, a black precipitate formed. All samples with lead present were also highly acidic. 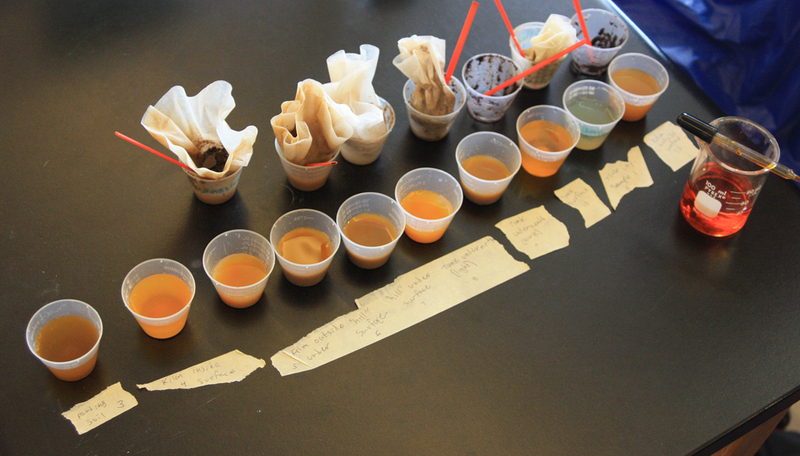 We also tested for soil nutrients, including phosphate, nitrate, and potassium. The only correlation was that the soils with higher levels of lead had higher potassium levels overall, but the correlation wasn’t completely certain. I had seen an interesting device demonstrated at a workshop for the landing of the Curiosity rover on Mars where we used reflectance spectroscopy to analyze rock samples representing Martian rock analogs. The ALTA II device uses 11 LED lights on the bottom to shine off of a rock or mineral sample, then a detector shows the relative reflectance of each wavelength, ranging from blue through red to four frequencies of infrared LEDs. Using a white paper and a black paper as controls, the percent of reflected light can be determined and charted. Before Intersession began, I had the chemistry students use the ALTA on a series of chemicals. 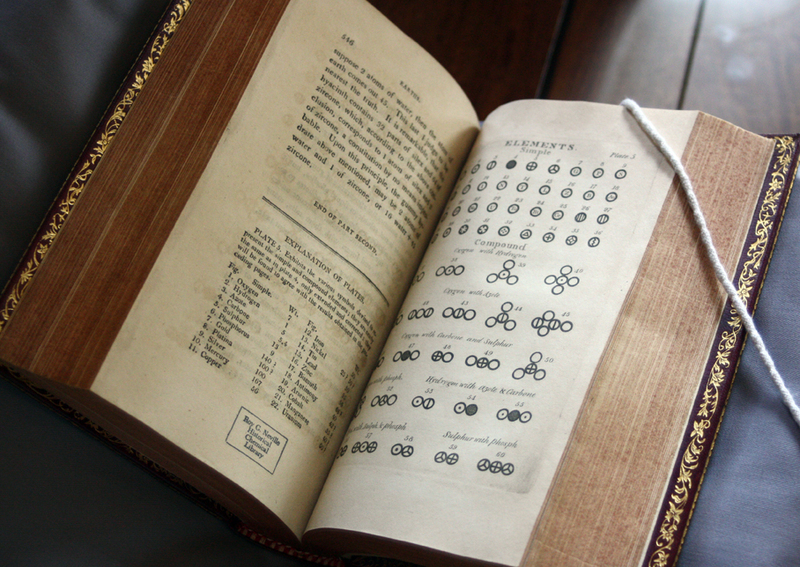 Some were white but of different substances, some were pure elements, such as copper, tin, lead, iron, and sulfur. 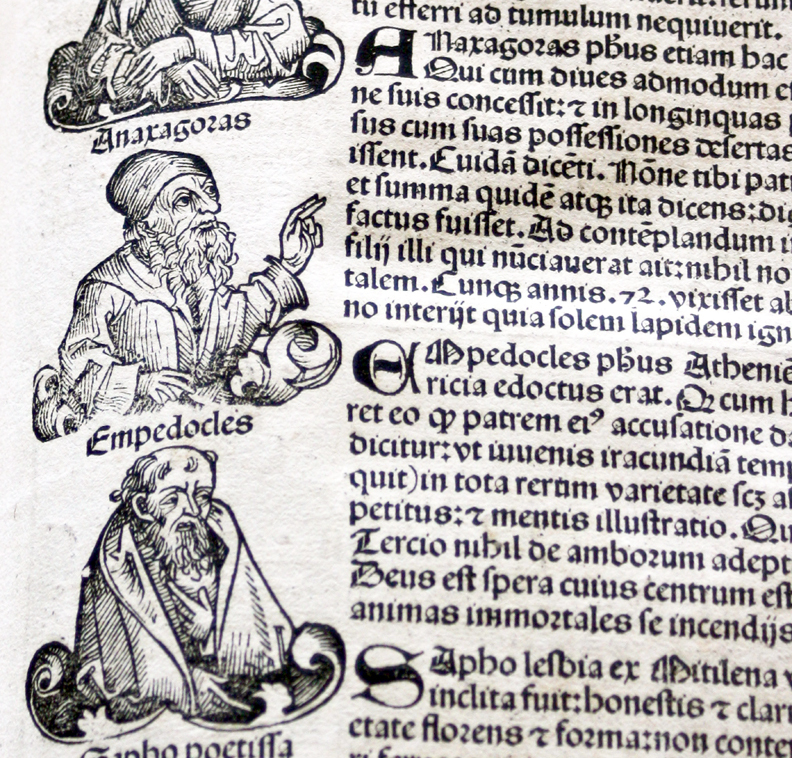 Others were alloys such as bronze or compounds such as copper sulfate or minerals such as iron pyrite. 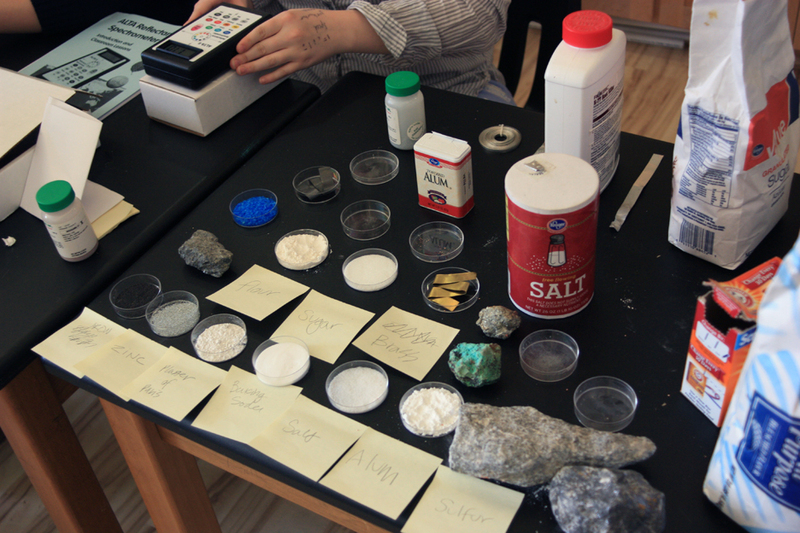 I wanted to see if the alloys were an average between the pure elements that made them up, and to see if the infrared reflectance was different even though the visible colors of substances were white. Reflectance spectrometer readings for various chemicals and minerals. There are 11 wavelengths read for each sample, which are compared to the values for white and black to get a percent reflectance. We also used the ALTA on each of the soil samples, and the results were fairly predictable in that the richer, loamier soils had lower reflectance at all frequencies (they are darker). The more mineralized and contaminated soils were lighter (more yellowish overall) and high reflectance. 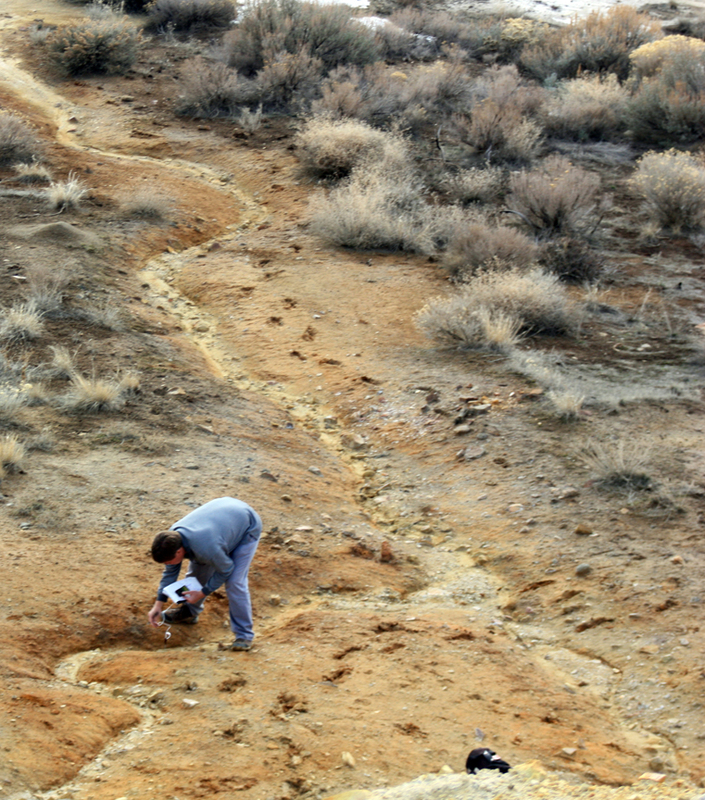 Yet the yellow soil didn’t necessarily have higher yellow reflectance – it might have higher green and red, which were combining to make yellow. This spectrometer isn’t specific enough to really give detailed reflection spectrums, which would show spikes at specific frequencies for lead or other elements. Recording data for the reflectance spectrometer on the Tintic soil samples. Doing 11 wavelengths of light for 42 samples created a huge data table. We also had all the nutrient, pH, and lead data. 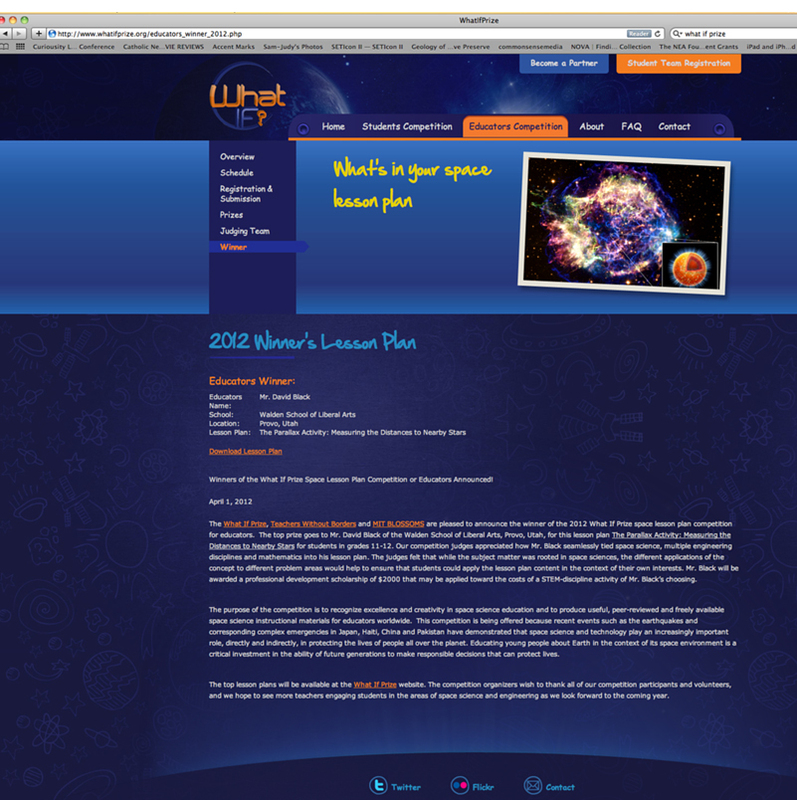 Jem set it all up in a massive spreadsheet. Our ten-day class finished before we had the chance to analyze the samples from our final collection trip, so another student, Jeffrey, continued to work on the samples on his own time. 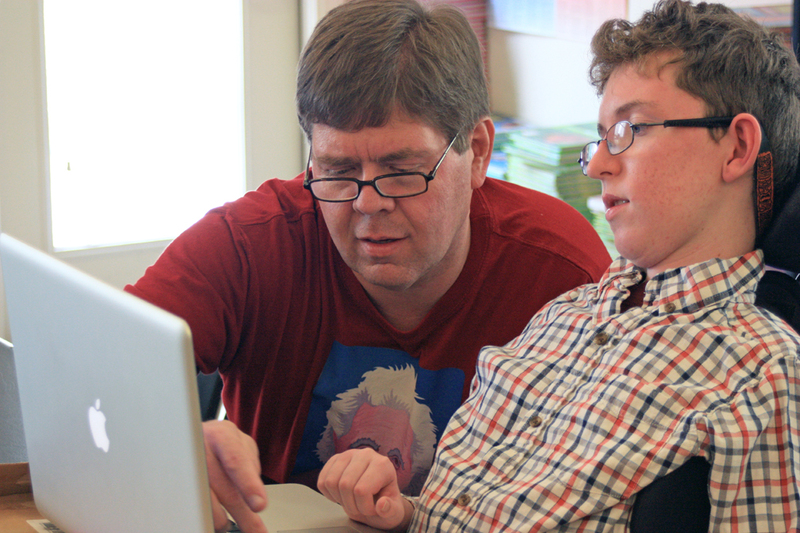 By the end of the school year the results were all finalized. I’ll talk about those results in my next post. Jem enters all the data into a spreadsheet. 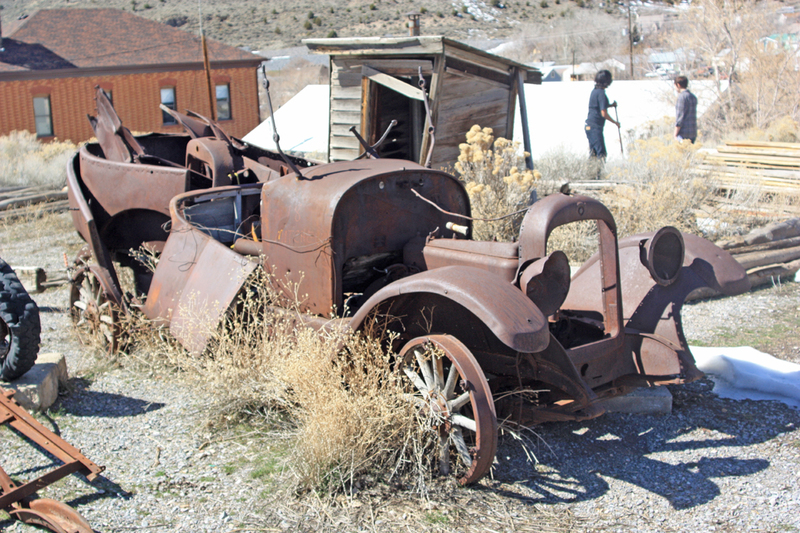 Old car behind the Tintic Mining Museum in Eureka, Utah. During our Intersession period between third and fourth terms, I taught a class that would help complete our study of lead contamination in the Tintic Mining District around Eureka, Utah for our American Chemical Society Hach grant. We had already visited the area three times to collect samples in the various mine dumps around the area, but we needed one more trip to collect samples from inside the town of Eureka itself. We traveled down for this last trip on Thursday, March 14, 2013. I had three students with me from Walden School: Jeffrey, Indie, and Aaron. 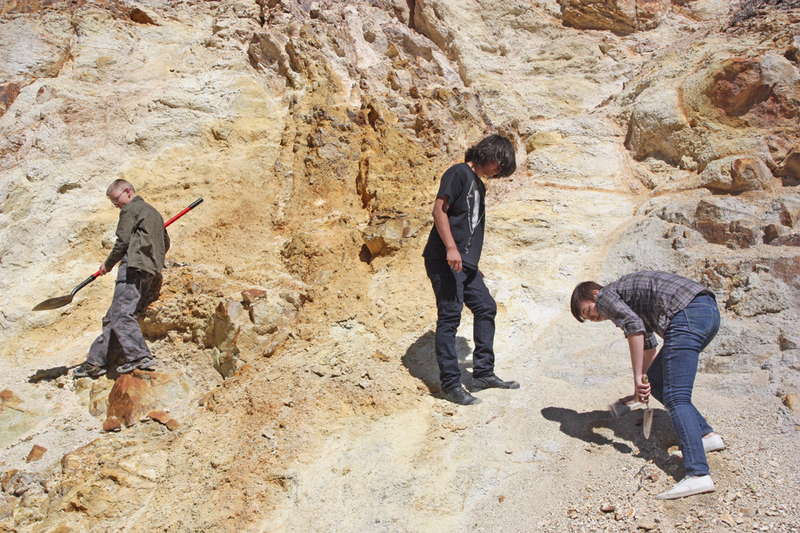 Aaron, Jeffrey, and Indie collecting samples of a hydrothermal vein at a road cut on Highway 6. We had scoped out the town and decided to collect at ten locations in the town and at least one location further southwest outside the entire district as controls. The town was cleaned up by the EPA as a superfund project, and $26 million was spent to dig up contaminated topsoil in sensitive areas, such as playgrounds, the baseball field, and lawns at the high school. Other areas have been covered with limestone fragments, or rip-rap, dug up at a quarry about five miles outside town and supposedly beyond the contaminated zone. Still other areas in town have had plastic netting laid over the ground, supposedly to prevent erosion from washing contamination back into the town. And there are many areas that have not been touched, with climax vegetation (mostly sagebrush and some juniper trees) that would take decades to grow. 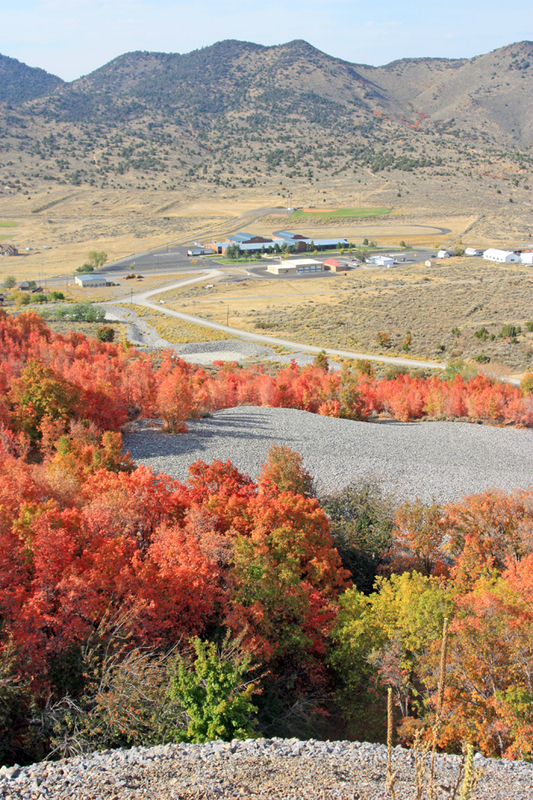 These untouched areas are even found upslope from sensitive areas, such as the high school. There doesn’t seem to be much rhyme or reason to it. The EPA claims that the problem has been solved, but my goal with this study is to provide independent evidence. Are areas inside the town still contaminated? I also wanted to get soils from a typical mineralized area that had not been mined or processed. There are a series of road cuts leading into town from the east where U.S. Highway 6 goes around several sharp turns. One of these curves cuts through a section of reddish-yellow rock and soil, the marker of a hydrothermal vein. We stopped and collected two samples, one from yellowish soil and one purplish-white. Then we drove on in to town to start collecting samples there. We began by driving up to a dirt parking lot near the high school baseball diamond. 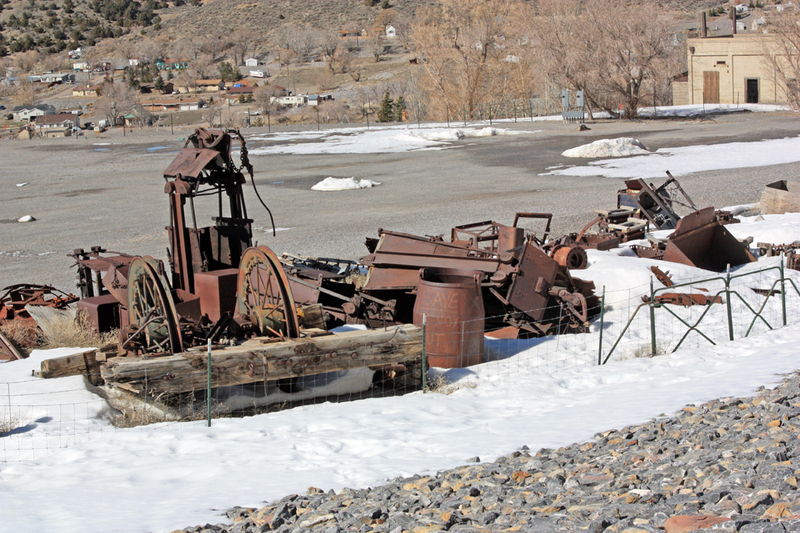 There is an ATV track there where contamination is likely to have been stirred up by the four-wheelers and washed down a small gully through climax sagebrush and junipers. We collected inside the track, in the gully itself, and at the base of the junipers in what was undisturbed original soil. 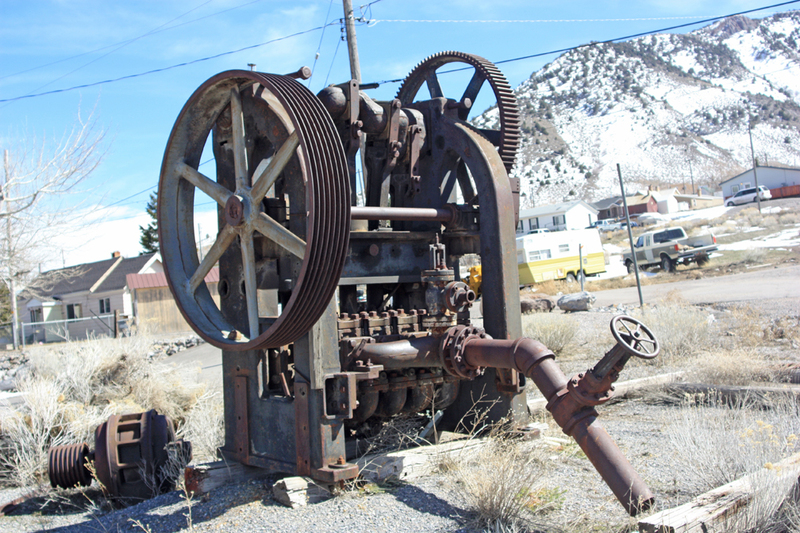 A pump used to drain water from the mines. 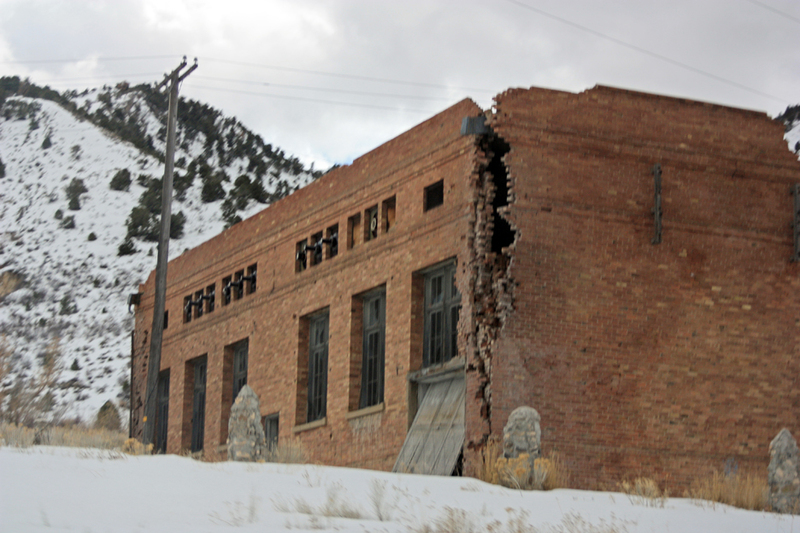 Power for the pump came from the Nunn brothers’ hydroelectric station in Provo Canyon. We then proceeded around town, taking samples on the surface and about six inches below at several locations, including a few empty lots, spots next to road right of ways and the city park, downslope from the Eagle and Bluebell mine dumps, and around an old house foundation that was long since abandoned and crumbling into ruin. 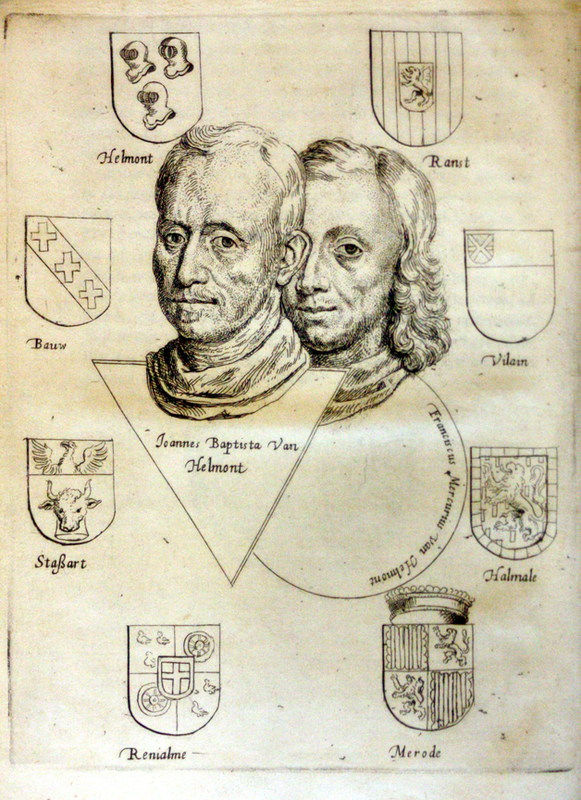 Altogether we collected at ten sites, or twenty samples, in town. We then drove out of town to the west and collected samples from the bottom of a wash about half way down to the old CCC camp. This would be a control. Although we needed to collect quite a few samples in a short period of time, we also took some time to explore more of the town. 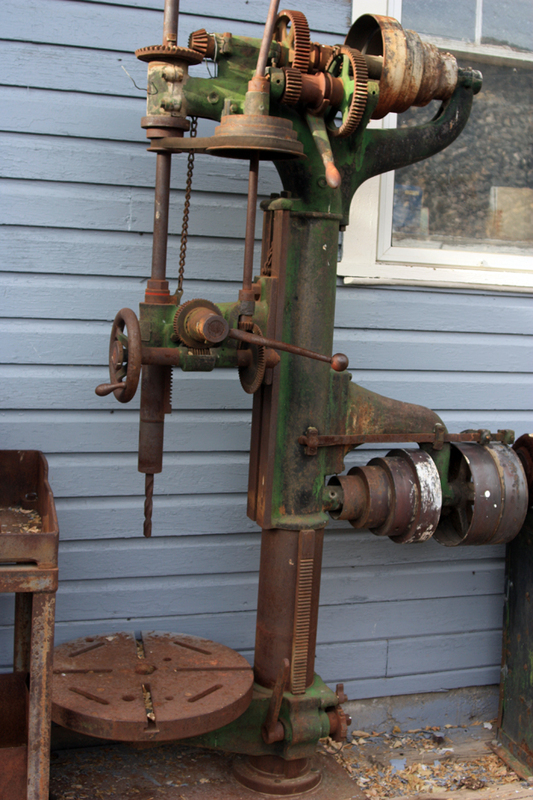 Around the museum, I explained to the students how the equipment worked, such as the pneumatic hammers, skip cages, water buckets, and muckers. They looked around the old jail and discovered some papers in a room underneath, including a booklet summarizing clean-up efforts after the flooding in 1983. 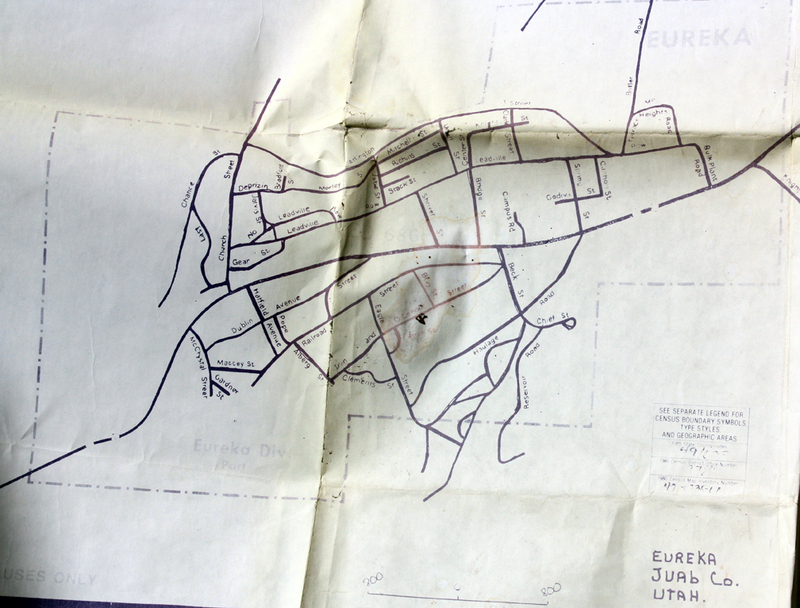 We also found an old, yellowed map of Eureka itself. I carefully took photos of these documents and put them back where we found them. It was a sunny, warm day and we didn’t need coats even though there was still snow on the ground in places. We drove up to get some pictures of the Eagle and Bluebell mine sites. I got out of the car and walked along a hill that is covered in rip-rap to take photos of some old mine equipment and got myself stuck in a snowbank for a minute. Mining gear at the Chief Consolidated Mining Company headquarters. All told, we have about 42 samples from over 20 locations all over the district. We had identified these areas using Google Earth last fall. In addition to our sample collecting, we shot video and took photos as we traveled around town, with the intent to put all of this into a video on the history and current challenges of the town. Now for the analyses! Plastic netting used by the EPA to slow down erosion on slopes, allowing native plants to grow. Ruined foundation of a house in Eureka. We sampled near here, since yard fill was often collected from the mine dumps. 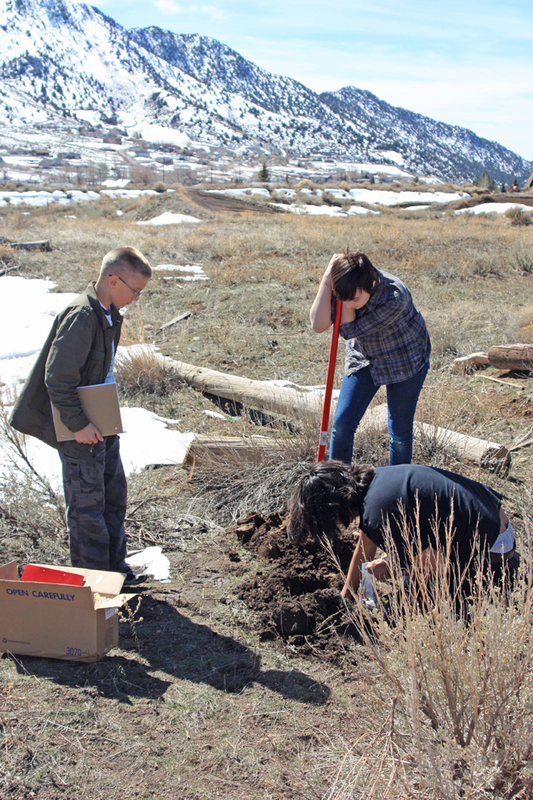 On Tuesday, March 12, 2013 I took three students down to Eureka, Utah to collect our third set of soil samples for our Amercian Chemical Society grant project. Jeffrey, Sean, and Indie helped to collect samples and measure the soil pHs, as well as explore the history of the Tintic Mining District. This time our first stop was at the old Tintic Standard Mine workings above Burgen and Dividend in the East Tintic District. 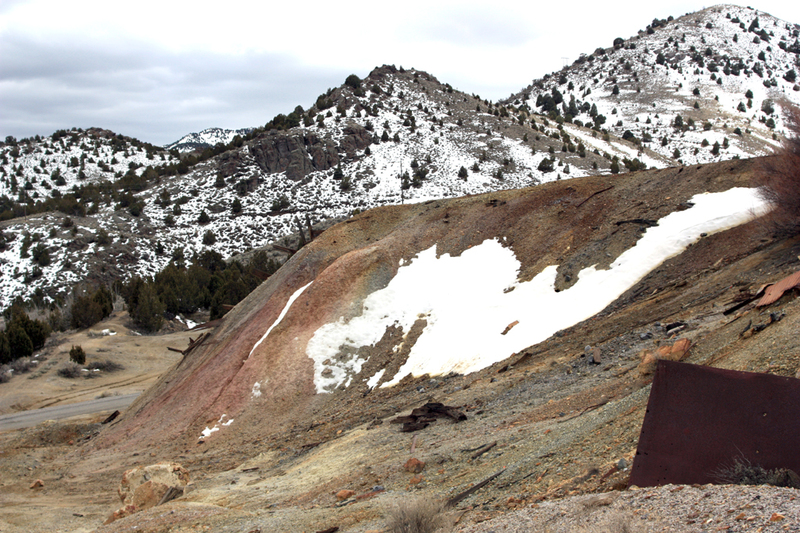 Of all the ore bodies in the area, these on the east side of the Tintic Mountains were the last discovered and the Tintic Standard Mine was in full production by the 1920s. A reduction mill was built across Goshen Valley at the warm springs near Genola. Workers lived in a company town below the mine called Dividend. The mine produced well into the early 1940s, when it was partly shut down for the war effort, then re-opened. Work continued sporadically into the early 1970s. Collar and shaft at the Tintic Standard Mine. Even with a chain link fence around the hole, the loose soil at the collar could cave in and makes this shaft a dangerous place if you get too close. There are still quite a few artifacts and ruins at the site, and care must be taken as there is a large vertical shaft with loose dirt around the collar, so you should stay well back from it. There is a large glory hole on the back hill and two water tanks further up, with the remains of a wooden ditch that brought water down to the company buildings and change room. The main portal to the mine went back from the change room, where there is still an old stove to keep the miners warm. That portal has been sealed off. 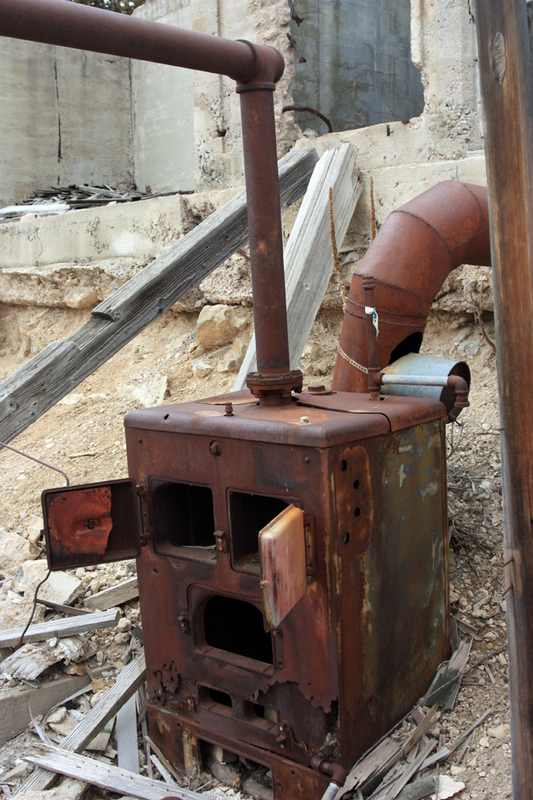 Stove in the change room at the main portal of the Tintic Standard Mine. This portal was active off and on into the 1970s. After exploring around, we collected some samples from the mine dump at the bottom of the hill where melting snow had created a clayey puddle. We also collected several samples along a trench that had been cut into the waste rock dump, where the soil was discolored with purplish or yellow deposits. The pH indicator needle pegged several times, showing an acidic pH of less than 3.5. It will be interesting to see what kind of lead content these samples have. 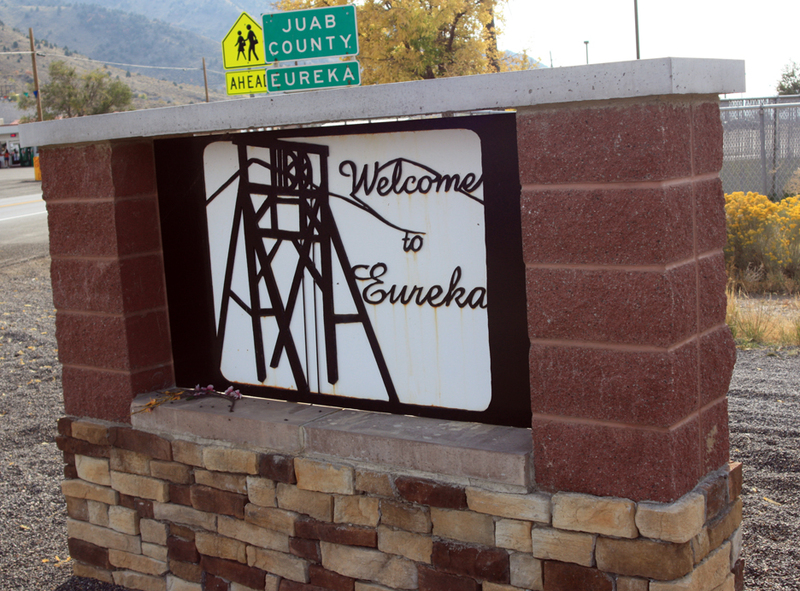 We then drove into Eureka and scouted around town for some additional sample sites to collect on our final trip on Thursday, as well as to look around the mining museum, old City Hall building with its jail in back, and the cemetery. I showed the students how miners worked the air-driven hammers and how water was sprayed into the holes through the center of the drill steel. We looked at the skips or man cages, the water removal buckets, and the mucker machine out front. We walked around Main Street, which was very quiet for a Tuesday afternoon. Only a few cars were driving through. David Black by City Hall on Main Street in Eureka, Utah. We drove out through the west end of town on Highway 6 and took a detour through the cemetery, recording with the Flip cameras as we went. 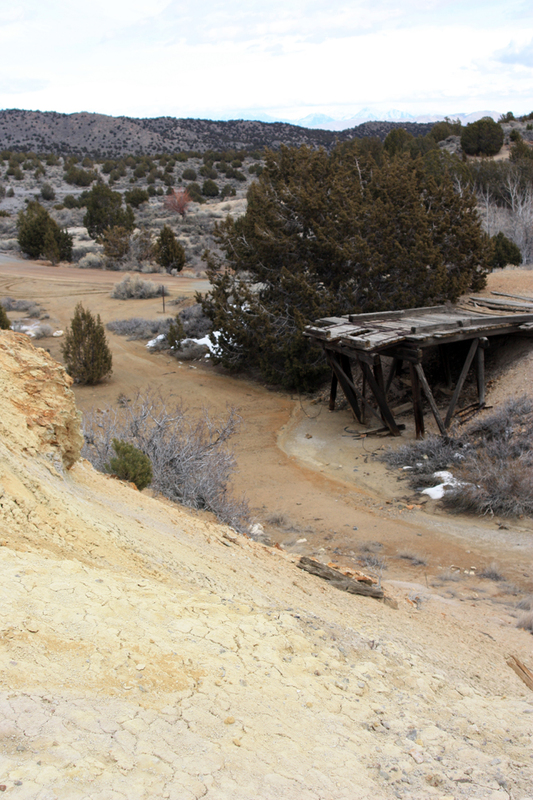 We explored around the town of Mammoth and collected samples in a wash at the mouth of Mammoth Canyon. 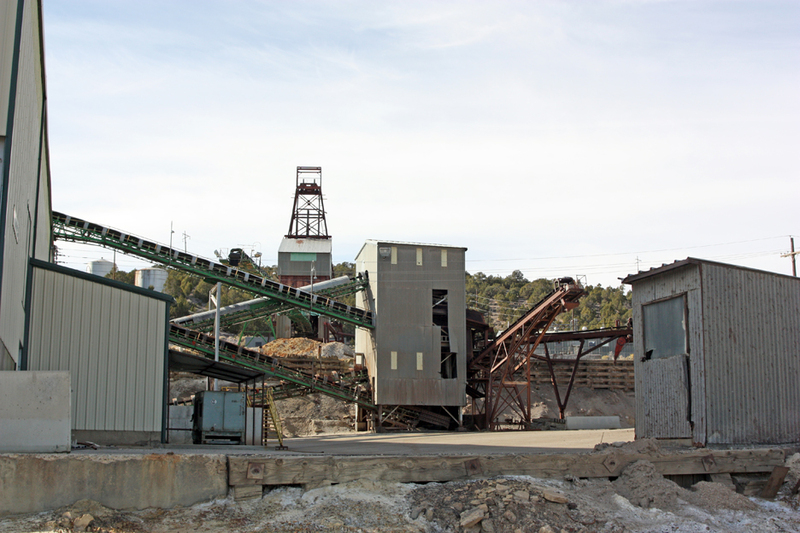 We then went on around to the Swansea mine dumps at Silver City to continue collecting samples. Ruins of the old power plant in Eureka. Heavy machinery moving through town has contributed to the deterioration of historic buildings like this one. Since last week, the snow has mostly melted and the ground dried out to where we could walk on it in most places without leaving muddy footprints. 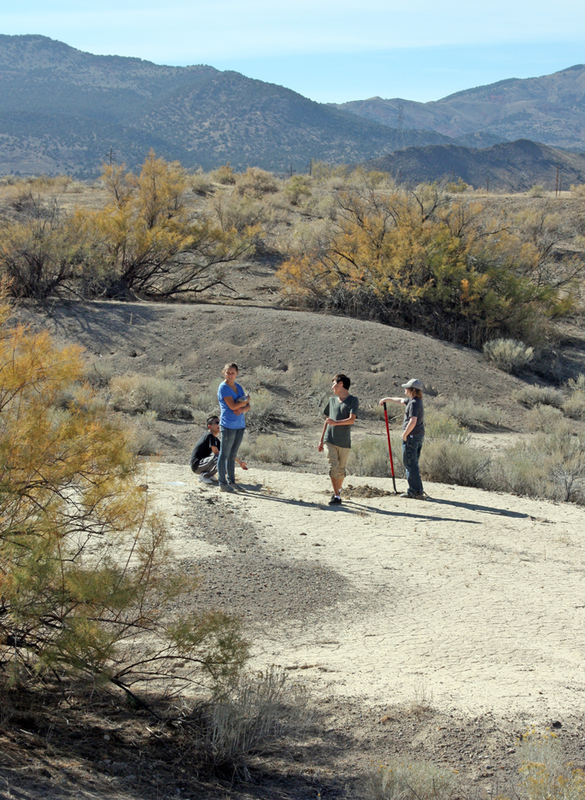 We sampled in several washes running off the main dump and in soils between the washes where some scrub brush survives. The main wash feeding off of the dump had several layers of brightly colored soils, ranging from reds to yellows to even a shade of green. Mammoth Mine, headframe, and glory hole. This was the deepest mine in the district, with the richest concentration of silver and gold ore. I can see we need to do more studying here, to see how much lead and acidic runoff continue down these washes into the valley beyond. The runoff water has left a red stain on the asphalt of the road over a hundred yards from the main dump. The soil on and near the dump itself and in the bottom of the washes is devoid of life. Even though the last time this mine waste was dug up was the 1980s, when the leach pile nearby was created, no plant life has yet to colonize the contaminated soils in about 30 years. 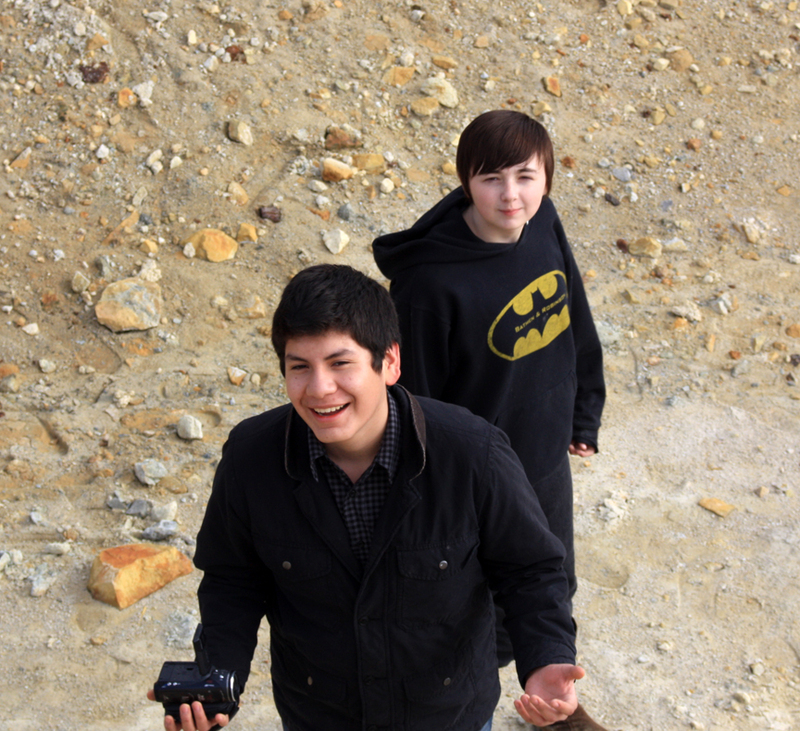 Sean and Indie at the Silver City mine dump. David Black taking pH readings in the middle wash draining the mine dump at Silver City. All told we had an enjoyable and low-key trip, and even though it was overcast the day was fairly warm. We had now collected all the samples we needed outside the remediated zone. 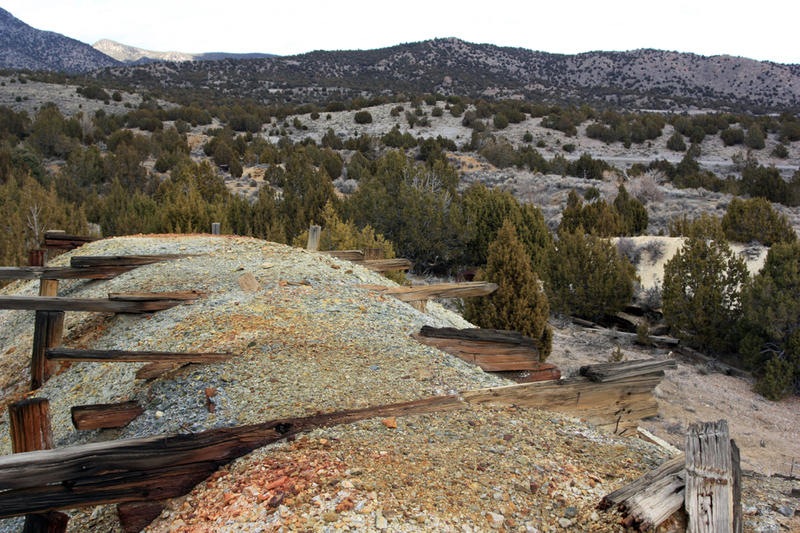 Contaminated soils in the wash draining the Silver City mine dump. It’s time to take a break from recounting my tour through Colorado’s mining towns last summer and catch you up on what we’ve been doing this year at Walden School of Liberal Arts. 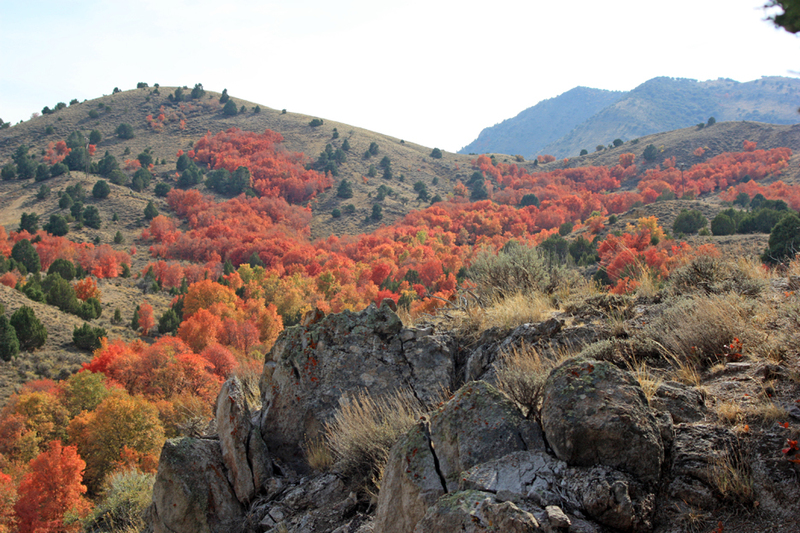 Maples in the fall near Eureka, Utah – with junipers and rabbit brush. 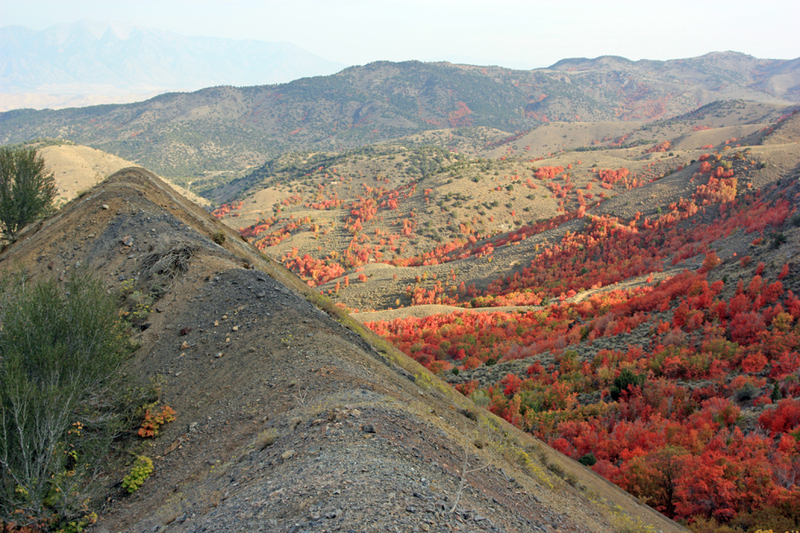 As mentioned earlier, we received a grant from the American Chemical Society to study lead contamination in the soils in Eureka, Utah and the surrounding area. 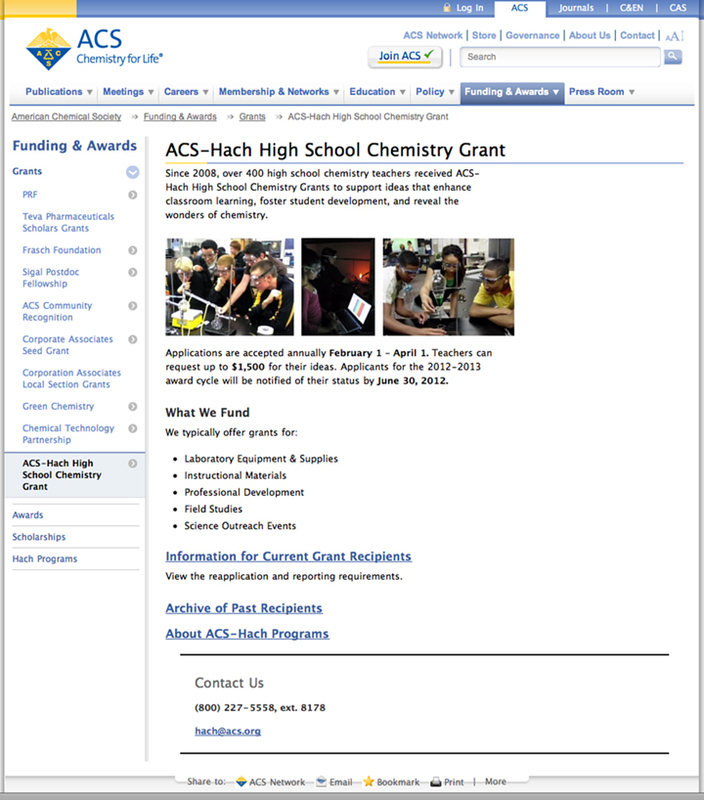 The grant provided funds for travel, equipment, chemicals, and supplies. It took until early October to receive the money, so our first trip down had to wait until mid-October. It meant we wouldn’t have much daylight, but we’d have to do our best. I’ve been gradually documenting the history of the area, collecting historical photos, taking photos around the town myself, etc. Back in 2009, I took a group of students with me to interview June McNulty, President of the Tintic Historical Society. He showed us through the museum and we videotaped the tour. Now, with this grant, we can tell the story of recent events in Eureka, especially the history of the EPA superfund project over the last ten years that cleaned up or covered up contaminated soils in the town. My science research class researched the history of the area during first term while we were waiting for the grant funds. They identified 20 collection sites outside town using GoogleEarth. Some of these are old mine waste dumps, some are around smelter or concentration plants or leeching piles. Others are control sites outside the district. We were going to collaborate with students at Tintic High School, who were to collect from sites in town. Unfortunately, our collaboration fell through, so my students eventually collected from sites inside the town as well. In preparation for our sample collection trips, I traveled down to the area to get some photos of fall foliage on Saturday, Sept. 22. 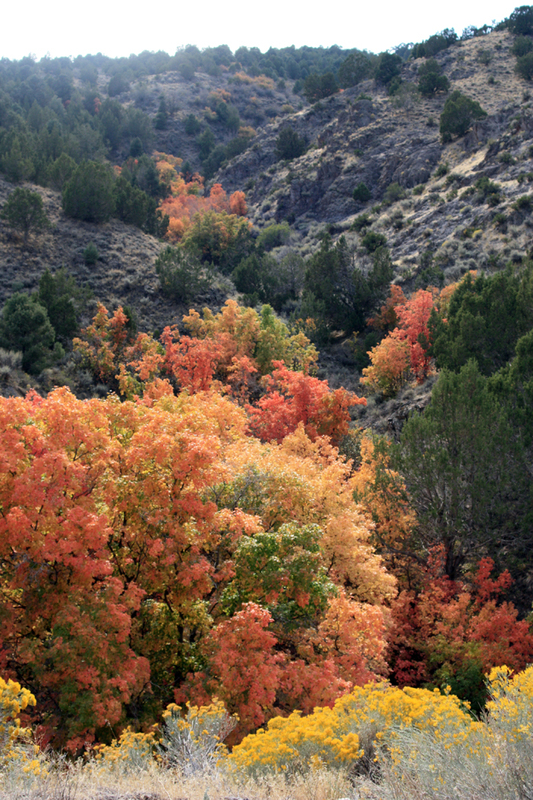 I got there just at the right time, when the maples in the canyons were at their brightest. I photographed some areas along Highway 6 leading into town and filmed the maples in the canyons along the road leading over the top to Dividend. I then took videos around town by attaching a Flip camera to my left rearview mirror with a small claw-style tripod. I drove up to the Godiva mine site and took photos down toward the high school, then drove further up the canyon past the Knightsville site and hiked around some mine dumps further up. I had seen that there was a valley nestled inside the East Tintic Mountains from GoogleEarth and my 3D models of the area. There was a road leading along the edge of the hills, and I walked around as far as the site of the Iron Blossom #2 mine. The headframe there has recently collapsed. It was a nice trip and the photos turned out well. I also saw and photographed several deer. I took four students to the area on Oct. 19 and we collected samples and explored the area, including the road over Silver Pass. We first collected from some old evaporation ponds near Elberta where hot water pumped out from the Burgin mines was allowed to cool and settle before discharging it into Utah Lake. During the early 1980s, as I drove home from college to my hometown of Deseret, I would pass through this area and see the water steaming as it passed down the gulley to the ponds. This was the last time they had attempted to open the mines at Burgin. We sampled from two locations inside the old ponds, which can be reached by a short walk from Highway 6. We then collected from the bottom of the wash at the mouth of the canyon leading up to Burgin. The soil here looked healthy and contained a combination of sand and humus. 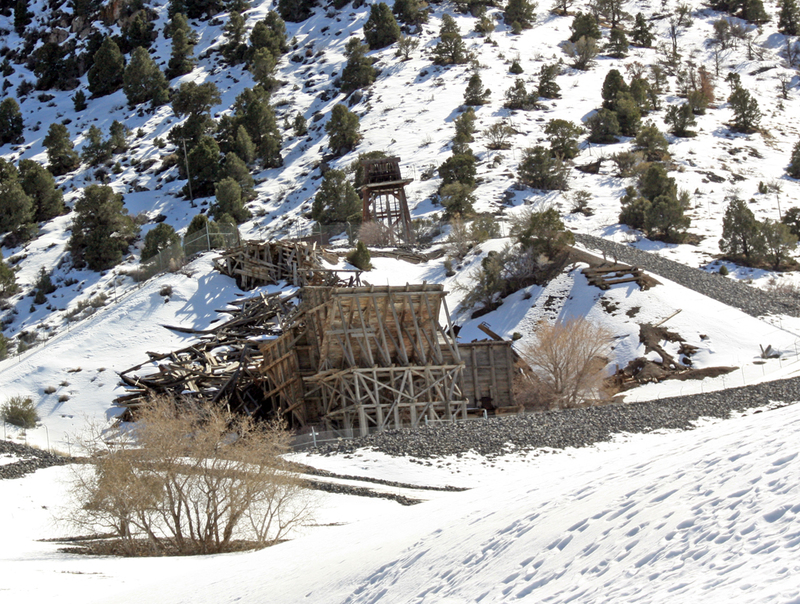 We then stopped at the old Burgin concentrator and took some pictures. I talked with the men at the main office of the Chief Consolidated Mine operations there about getting some samples from the tailings piles (they corrected me when I mentioned “tailings piles” around the headframes themselves and said those rocks were more properly called mine dumps or waste rock; tailings are the actual ore that has been processed). 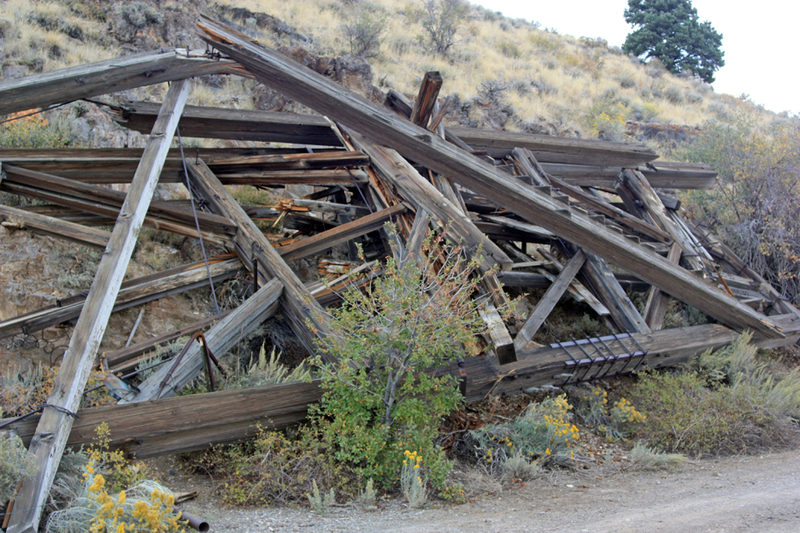 We took photos around the Trixie headframe, then drove on up the canyon over the top of Silver Pass, which I had not done before. 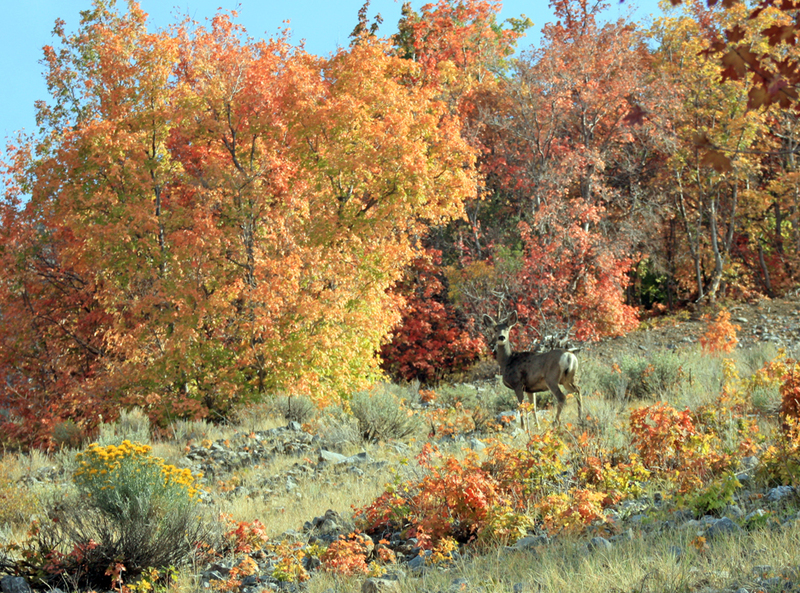 This was the opening of the deer hunt, so I didn’t want to venture too far from the road without orange clothing. 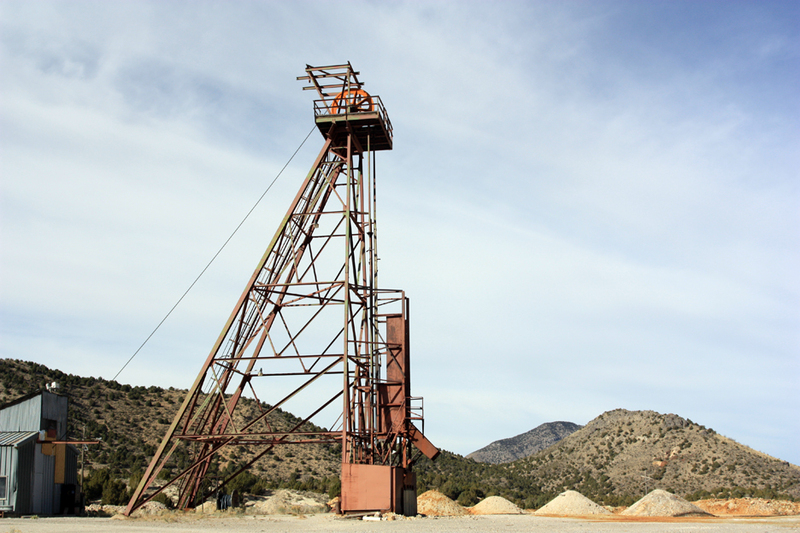 Headframe at the Trixie Mine above Burgin. 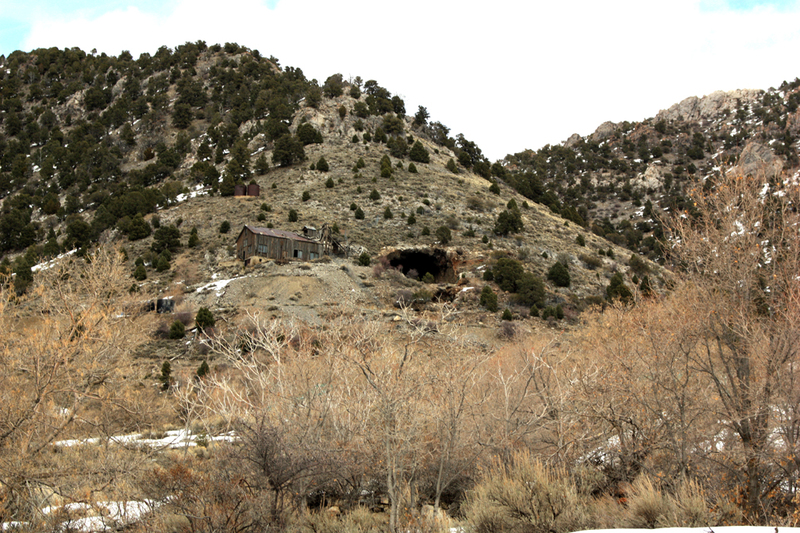 We also collected at a mine dump next to the road in Ruby Hollow, which I later identified as the Tesora Mine. The soil there had a bright yellow color and contained obvious sulfides. Part of the shaft is still there without much protection around it. I also showed the students Silver City, the leeching pile from the 1980s when much of the waste rock and tailings were heaped up and cyanide solution was sprayed onto it, chelating the silver and gold out of the rocks. We stopped at the Bullion Beck headframe for photos and walked around the Tintic Mining Museum. It was late afternoon by then and time to get the students back. Altogether we collected six samples from three sites and the students had a chance to get to know the area. I knew that we would have to be more productive on our next trips. Back at school, we did some simple pH tests and found the first two sites (Elberta Ponds and Burgin Wash) were near neutral pH, but the Tesora Mine samples were quite acidic, at a pH of about 3.5. Other tests would have to wait until we ordered the testing supplies. 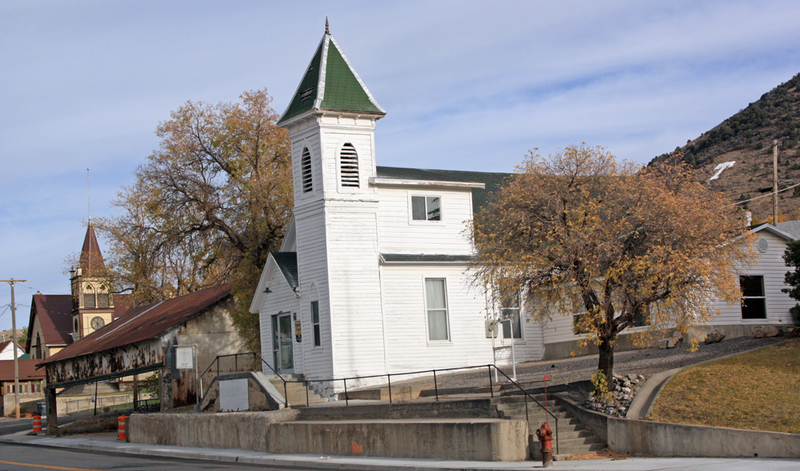 Historic churches in Eureka, Utah.